The Okavango Delta is the last-remaining wetland wilderness in Africa. Today, man is only beginning to exert control over this beautiful place by erecting more fences, continuing hunting, eradicating the tsetse fly, and increasing the number of lodges. Cattle, people, fishermen and farmers are waiting on the edge of this green oasis ready to supplant the resident wildlife and claim Eden for themselves. Read here about the research projects that we (the Percy FitzPatrick Institute) run in the Okavango Delta and our efforts to protect this wilderness by advocating for World Heritage Status and more commitments from countries committed to the Kavango Zambezi Transfrontier Conservation Area (KAZA). For hundreds of years the Bayei and Banoka people have lived in harmony with the seasonal challenges of life in the Okavango Delta. Our expeditions interact with small nomadic fishing communities and employ guides from these villages to assist us in penetrating the more inaccessible areas that we need to survey. Meeting this local people, enduring hardships with them, and living with them for days on end, brings alive the rhythm of the wilderness, the calm relaxed state of being that we should always exist in. As the saying goes: Every river has its people… and untold stories. 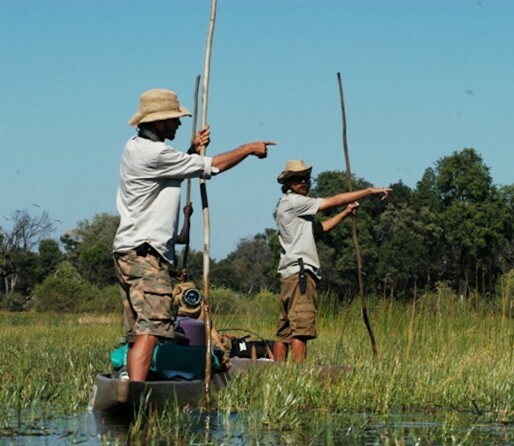 2010 Expedition: 1st time to cross the Okavango Delta in “mokoros” or dug-out canoes with two Bayei men from Seronga Village. 25 July 2011: “Crossing the Okavango for Wetland Birds”: A research team is going to cross the Okavango Delta in three “mokoros” (dug-out canoes) to survey the in support of the lobby to have the Okavango Delta declared a World Heritage Site. We will have two Bayei men, GB and Chaps, guiding us down unexplored channels and poling two of the support mokoros. From 3-18 August, we will weave our way through a vast network of narrow channels along an ancient mokoro route to Maun in search of wetland birds. Last year we completed the first expedition and managed to record the distribution, abundance and breeding activity of over 12,500 wetland birds along our 248km expedition path. Over the next 8 years, we will undertake this dangerous route through areas inaccessible by boat, vehicle or foot to establish the impacts of developments in the catchment and within the delta itself. A hydroelectric weir in the Caprivi Strip, 16 dam refurbishments in the Angolan catchment, and agricultural development along the Okavango River itself are being planned. New camps are being built in the Okavango and boat safaris into the delta out of Main are on the increase. Huge floods last year pushed all supplies for the camps and lodges onto the waterways, increasing boat traffic in the southern Okavango Delta several times. By the time we got past the buffalo fence, one day from Maun, there was an oil slick on the surface. Quite surreal watching leaves and feathers moving with the wind on the oil slick in the opposite direction to the floodwater. Surface water also became foul-tasting near Maun. A stark contrast to the purity we had been drinking for the weeks before. As can be seen in the graph of flow rates near Maun (Yes, indeed, good-bye Maun’ites), the flood of the century has arrived. We are going to have an extremely interesting expedition. The first 5 days are going to be much more dangerous due to deeper, faster-moving water and big crocodiles in the reedbeds. There will be very few islands suitable for sleeping on. The route will be a lot trickier with papyrus rafts opening and closing narrow channels. Camping will be tricky, however, due to many more elephants on all the islands above the water. Much faster flowing water requires advanced mokoro skills or a swim with the hippos. In short, we are going to have an adventure the likes of which has not been seen before. We are preparing for a wet, wintery experience in the wilderness with the first migrants arriving in large numbers. We will have a daily satellite link-up and be uploading a daily blog with GPS points. We will also maintain a map with the GPS-position updated daily. GB and Chaps are Bayei (River Bushman) from Seronga that guide tourists on 1-2 day mokoro excursions and hunt in the area. They own the mokoros and take over poling duties in more dangerous situations like deep lagoons with hippos. Myself and Jerome Hillaire travelled with them last year with great success. Chaps has an uncanny ability to navigate by recognising islands and watching the flow of the water very carefully. Lessons learnt from his grandfather’s generation that used this ancient mokoro route to avoid deep water and get grain and millet down to the markets in Maun. We won’t see many people along the way, except for Jedibe Village in the Okavango, and the odd family of subsistence fisherman on remote islands. 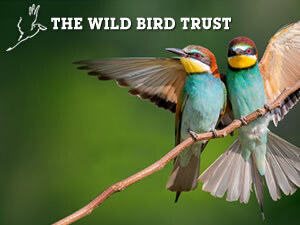 Welcome to the first day of this Wild Bird Trust expedition (in collaboration with the Percy FitzPatrick Institute). Sitting here in the middle of nowhere with an online Macbook powered by solar panels and connected by satellite is very new to me. I feel like checking my email, but will try and stay away from them for the weekend. Such is life in the modern world… even though I feel like I am somewhere in the distant past before computers, GPS and satellite. I suppose we are an anachronism in this place that hasn’t seen or heard of modern civilisation, a place deep in the middle of the wilderness, a place that will make you believe in God. This morning, we were woken by an amazing sunrise over Guma Lagoon, which is directly across the Okavango River from Seronga (our launch site). This wonderful oasis was very welcome after three days of hard driving to get there. After gathering our things together, packing, re-packing, washing, drying, water-proofing, tapping, tucking, and… a cup of coffee, we departed on a 1 1/2 hour/24km boat trip to Seronga boat station. Soon after arrival we were met by GB, Chaps and Tom, our Bayei guides and polers from Seronga, and certifiable human GPSs with backs of steel:) A hot day took us through open floodplains filled with African Jacanas, Long-toed Lapwings and much else, narrow papyrus channels that had been totally destroyed by the thousands of elephants that entered the delta about two months ago, as well as clogged, shallow reed beds that are home to hundreds of warblers, crakes and kingfishers. For Pete and Giles this was a completely new experience mokoro’ing deeper and deeper into the delta. Both are now a few shades darker from the burning sun and many years wiser in regard to life on the waters of the Okavango. By the end of this epic mission they and all of us will have new realisations about the world we live in and the value of wilderness with teeth, wilderness that demands your respect and if disrespected grabs you by your collar and throws you around until you behave like a member of the natural community that surrounds you. In total, we logged 115 wetland bird sightings including over 200 birds from 18 species. A nice start considering that conditions in the northern delta are at least 2-3 weeks away from being attractive to wetland birds due to the flood waters still covering most of the small islands and floodplains that provide food and nesting opportunities. Day 2 was a long hot trudge through a narrow maze of papyrus rafts, small lagoons and dense reed beds. We departed from what we names “Two Shoe Island” (we found two abandoned shoes from local fisherman on the island) at about 9am. We had to wait for the hippos that were very active the night before to settle into the deeper lagoons and channels before setting out on what are essentially paths they share with elephants. The day went without food due to the lack of suitable islands and the rush of trying to get to Jedibe before sunset. By 3pm we knew that we would not make it all the way to the only village inside the Okavango Delta and began looking for islands to sleep on. All were salted out, too wet or too small. We settled for a slightly salted, slightly wet and just too small island that we named Phiri Island (after the hyena that called through the night and sloshed around the floodplain. The evening ended up being an amazing one with the stars out and wonderful night sounds. Corona Australis, Aries and Scorpio were wonderfully presented in the northern sky. Our night ended with a small whisky by the fire and discussions about the days ahead. Tomorrow we will be in Jedibe by 10am to collect a guide and move onto Madinari Island. Our survey recorded 155 new wetland bird sightings, including notables like the Lesser Jacana, Palm Thrush and African Marsh Harrier. We also saw lots of Long-toed Lapwings skulking around in shallow floodplains waiting for the water to recede, thus exposing their favored nesting sites and the food supply that comes with the annual floodwaters. Last year, we found hundreds of lapwings and Painted Snipes breeding on these same islands after the departure of the floodwaters. Similarly, the Squacco Herons were all looking quite lost, as opposed to being all lined up along the channel margin in dead grass that has died since the departure of the flood. Last year we saw breeding colonies of over 500 herons spread over several kilometers. New this year are flocks of over 80 breeding Fan-tailed Widowbirds on the smaller floodplains, usually dominated by Greater Reed Warblers and Lesser Rush Warblers. We look forward to the days ahead, to Chief’s Island and to updating all of you on our progress. Giles, Pete, and Chris have all settled into their roles on the expedition, as have I, and we are getting more and more excited at the prospect of further adventures. GB, Chaps and Tom are glad to be out of Seronga after a very quiet year that saw only one two day mokoro trip come to the poler’s trust. Pete is talking about Anja more and more, Chris about Francoise, I about mee lady Kirsten, and Giles about Mum and the folk back home. We are all missing you guys terribly and wish that you were here. Day 4 began very wet due to a harsh drop in nighttime temperatures that condensed our collective sweat from the day before onto our tents and everything else. Our tents and bags were soaked, the batteries and panels were sparking and now discharged, and everyone simply just looked a bit damper than they usually do on a morning in the Kalahari. By 9am we had dried ourselves and were ready to leave what we had named Sunbird Island due to the numerous different sunbird species found feeding on the profusion of late winter flowers on the island. Absolutely stunning to see them radiant in the light of the sunset:) We only managed, however, to depart at around 12pm because our new guides and members of the flotilla, Mombo or “Comet” and his good friend “Judge”, only arrived at 11:45. We excused them because they are both in their 70s and the only people in Jedibe village that know how to get to Madinari Island, most probably because they hunt there – Judge brought an ancient rifle with him for the trip. They will be joining us for 3 or 4 days… After a late start we progressed rapidly along channels adjacent to the Jao Channel. Our intention was to make it to Madinari Island by nightfall, but we fell short as a result of stops to chat to subsistence fisherman and to do a spot of fishing ourselves. When I say a spot of fishing we saw some small tiger fish swimming away from a piece of deep water and decided to stop and fish a little. Within 20 minutes we had caught 17 nice size tigers and three bream. Understandably we spent of the evening until midnight eating fish and smoking the rest. We now have lunch for everyone and food security for our growing expedition. Tomorrow Mombo is guiding us to Madinari Island from where we will attempt to approach the floodplains adjacent to Chief’s Island in order to spend four days surveying wetland birds feeding on seasonally-flooded grasslands and the very first fish traps. A friend of mine in Maun spent 18 months living in the Okavango Delta on a mokoro. He describes Madinari as paradise. The best wildlife in the Okavango in a place that is only really accessible by mokoro and helicopter. No one will ever be able to build a camp on this island, no one will be able to develop unless we drain the delta or the channels shift significantly. Our only concern is that subsistence poachers may have become established on the island due to its inaccessibility. We are looking forward to looking back in time and, hopefully, finding a place in the wilderness untouched by the ravages of our modern man-made world, the “Anthropocene” that we have decided to inflict upon the world. We hope that we find the lion to be king, the elephant as the lumbering gardener and zen master, the hippo as the lord of the waters, and the diversity of life supported by a functioning wilderness area. We look forward to being recharged and enlightened – wild, pure life is a wonderful thing. The survey recorded an additional 148 new wetland bird sightings, including 62 Fish Eagles, all of which booking their perches for the catfish run in the coming months. As far as fish eagle fishing spots go, the small channels and floodplains adjacent to the Jao Channel are perfect. Good times in a great place… Til tomorrow. Today we were taken by Mombo and Judge to Madinari (“Mother of the Buffalo”) Island off the northern peninsula of Chief’s Island. The journey was very tough because of a portage over an island to get to and across the Jao Channel before reaching the island. We had cut feet, lots and lots of leeches, and a few hours of poling and pushing our way through the papyrus, dense reedbeds and muddy islands. By far the hardest day took us to the geographic centre of the Okavango Delta. Tomorrow we will push on to Chief’s Island to survey wetland birds on the very productive floodplains along this iconic island. This morning we were entering a ledibe (lagoon) and had our first serious hippo encounter with a large, angry male rushing a few metres in front of us with ivory on display grunting loudly all the way. Mombo (righthand photo) and Judge (lefthand photo) then started to follow the hippo into the side lagoon that it ended up in. Obviously we all thought this was madness. It seemed, however, that they simply wanted to go there to shout at the hippo for taking them by surprise and being such a grouch. They said: “Come back if you want, as we are not scared. You are wasting your time”. Once they were satisfied that he was completely deflated and wouldn’t do it again, we progressed further NNE in the direction of Moremi Hippo Pools and Madinari. Lovely to see two men of the delta in their home. They live on the water and have the Okavango’s blood in their veins after a lifetime hunting, fishing and eating of this amazing system. Along our way, we collect water lily tubers, papyrus stalks and catch fish for dinner. These food resources are available year round and are plentiful. We use blue bush roots as toothbrushes and lily flowers as eye drops in the searing sun. The Okavango Delta is a wilderness that has been written about many, many times in National Geographic publications. It is a place that can help us, help humanity find a rhythm that will see us live in harmony with our only world, our only natural environment. There is a certain feeling of detachment, of calmness, of living only for the next week or two, accepting everything, and living to work as hard as you can everyday to earn a few hours sitting in the shade. A rhythm that brings us closer to a state of peace and calm, innocent in the wilderness we came from. This is not to say that life in the wild isn’t hard. As Judge’s shirt says: “Africa is not for Sissies”. The wetland bird survey yielded some interesting results today – 115 new sightings. Again this year there seem to be huge numbers of Open-billed Storks descending on the delta from up north. We saw our first spiraling flocks of over 400+ storks circling over floodplains filled with the snails they crack with their nutcracker bills. Our hours spent in the heat of the blocked papyrus paths and reedbeds gave us many Lesser Rush Warblers, Sedge Warblers and Fan-tailed Widowbirds. Again, we saw fish eagles lined up along the channels and Pied Kingfishers every 5 minutes or so. By far the best, hardest, most emotional day so far. We spent the whole morning until 2pm slowly poling, pushing and portaging ourselves through thick reed beds and papyrus before popping out on the other side in paradise. Quite literally. Emerald green paradise filled with life, buzzing, flying, feeding, swimming around us. Crocs, hippos, elephants everywhere. As we broke through the reeds we were met by three huge pods of hippo within the first hour. Up close and personal. It is particularly alarming when your mokoro is stuck on a sand bank and you are struggling to move it when hippos start gathering around you to display and have a look. Best policy is to remain calm and collected appearing to simply carry on with what you are doing as opposed to panicking and pushing the mokoro violently to get away. Stunning interactions in a stunning place 5km from Mombo. The island we have decided to camp on tonight has two pods of hippo in front of it and is covered in elephant. This is truly bush that speaks to your soul from the dawn of time with a chorus of hippo, distressed elephant, lion, and hyena. All night in the almost full moon light. The whole night a battle raged across the floodplain between the lions and hyenas. Screaming and roaring for hours. Ahhhh… wilderness with teeth. The vibe in camp was one of excitement and exhilaration. Chatter around the campfire was spirited and would only stop to listen for new sounds, after which discussion flared up again. Our little group of 9 was in paradise. This is what a feels like to be alive, truly stimulated by the environment around you. This is and will always be the big show, real life, my spiritual home, our spiritual home. If the world was to lose a place like this to development and mismanagement, a part of all of our souls would be gone forever. World Heritage Status is essential. As we change and control the natural world close to us, we assume dominion over these ecological functions and manage our world for our own safety and security. With this security comes great responsibility, which ends up being stressful, messy and eventually unsustainable. Look at our urban centres. Out here in the wilderness we do not control anything at all, which, to me, is a liberating feeling. No longer do we have to worry about who is supplying the products I like, the food I prefer, the services I need. Questions like “How much does it cost?”, “Can I afford it?”, and “Did I lock the gate?” become distant uneasy memories. We were all born to find ourselves in the wilderness of our destiny… Go now and find it, love it, and then protect it with your life! By 2pm on Day 7 we had managed to find a suitably located island off Chief’s near the channel from which to operate a more detailed assessment of the thousands of wetland birds that concentrate along the very productive northern peninsula. We have already found two new Slaty Egret heronries and noted several new sites with breeding Wattled Cranes (usually with the chick from the previous season). Our sighting frequency per day along Chief’s Island per day far exceeds our wetland bird sightings in the previous 6 days – by a factor of 4! This truly is the beating heart of the Okavango Delta. The waters are murking and filled with hippo dung, the place is buzzing with life. Snails, larvae, small fish and freshwater shrimps abound. Frogs, edible lily seeds, all manner of nymphs, boatman and water life. In the north of the delta where there are lots of fishing camps and subsistence hunting, the waters of the Okavango are clear and pure. Here off Chief’s they are churned up by the activity of life. I must say that I far prefer the taste of my morning coffee (distinct dung flavour) with elixir of life. We are now seeing hundreds of hippo, many buffalo, giraffe, lechwe, reedbuck and much else from the mokoros. Elephant breeding herds are all over trumpeting their dominion over this place as frequently as possible. For the past two days, elephants have been shacking the palms scattered around our island to dis lodge the palm nuts. They are a constant, comforting presence, very calm. Starting from our first evening here there was a chorus of lion calls in the near distance. At least three sets of pride males and few individual females with cubs. Under the full moon last night we listened intently to the goings on and plotted an early morning investigation of the island, which on the first day had yielded a leopard sighting near our camp, which was also the location of a white rhino latrine. We set off at about 9am and made our way painstakingly slowly towards the top of the island by skirting the side of the island and following more open hippo paths through the palms. After 2 hours we had made it closer and closer to where we had by then spotted vultures sitting on a termite mound. Then we saw her. She was crossing the open floodplain, most probably to see what the sloshing caused by our crossing onto her island was. She saw us and then turned back to the clump of palms with the vultures. About 100m to the a termite mound and we could see her and five 12-15 month old cubs. We understood it was just her and made a pass around the side of the island to have a better look at the cubs. Once there we were met by her hissing and posing ominously. Our apologetic nods and we were off back to camp filled with the life force of wilderness with teeth. A quick snack and we were off to survey wetland birds… hundreds and hundreds of them. We look forward to another evening in amongst the lion prides on our island off the channel. Tomorrow, we depart for the Xigera area and then onto the southern delta. We hope to make good time to Maun and record more interesting wetland bird sightings. Wish you were here. Before going into our morning with the elephants I must emphasize the massive size of the crocodile we mokoro’d 30 meters over. Must have been 4 meters long and wider than the mokoro. On a narrow six meter wide dead-end off from the channel, this croc was able to disappear into a cave under the bank. Wonderful to see and experience a true beast of the Okavango. The danger that lurks in the deep water that keeps us aware and respectful of every moment on the water. You are never really under threat, but the fear of it happening makes you feel alive. The thought is spine chilling and we all know of someone that has been attacked by a croc and survived or disappeared… GB’s story of being knocked out of the mokoro and swimming along the bottom to safety on the bank of the Okavango River. When you get the chance to swim on a sandy bank the experience is many times more exhilarating than swimming in a stream or dam without crocodiles. It is perhaps closer to swimming in the deep blue of the wilderness that is the ocean. I will never forget seeing that crocodile slide slowly past 30cm below the mokoro. This morning we were greeted by two elephants in our campsite for the third morning running. This morning I was charging batteries in my tent at just about sunrise and suddenly started hearing everyone outside the tent saying “Steve, Steve!” softly, but progressively more panicked with each repetition. I had stuck my head out by the time the clapping and shouting had started to see the younger male with his head down coming straight for my bright red tent. I panicked and stuck my head back into the tent and then instantly decided to launch out again to face or dodge the charge. He stopped, moved off and started grazing, very slowly on grass nearby, always keeping one eye on us. The nature of our camps are that we pick them between 4 and 6pm, so can’t pick and choose, and usually end up using hippo or elephants paths to access our campsites, which are all clearly popular feeding sites. Sometimes we are forced to use narrow hippo and elephants paths as tent sites and need to block them with logs overnight or be prepared to scare off elephants. Lovely, lovely times in the Okavango. I cannot describe how happy and alive it makes me feel to be here. This evening before arriving at Ma’Phiri Island (so named because Giles saw hyenas on the island) we were again blocked entry to an access point to an island by hippos rushing at us. Again we backed out gracefully and took the long route. Due to strong wind and much time in shallow floodplains we had only 105 new wetland bird sightings. Lots of fish eagles, one was eating a catfish about a meter away before flying off. Harry’s Camp is definitely in my top two for the trip. Amazing night sky, awesome zen garden of sun-bleeched leadwood branches, hyena den, and soft, open campsites. Sunrise was absolutely stunning:) Looking forward to Day 12, which looks like it is going to be a colder, windier one… We saw elephant, giraffe, buffalo, hippo, reedbuck, lechwe, hyena, crocodile, and much else yesterday. Let’s see what today, Day 12 has in store for us. The group is already starting to talk about Maun, the bright city lights, and loved ones. Anyway, we got underway and were enjoying the morning doing our research until we bumped into our first hippo of the day. The hippo was alone and relatively relaxed. We pulled over to observe him and then noticed the drone of a boat engine in the distance and decided to wait for them to pass, as well as warn them about the hippo in the middle of the channel. After 5 minutes two heavily loaded, highly overpowered boats arrive with 4 people on them. There are 7 of us and they had at least 4 times more luggage. In addition, their trip is 7 days, while ours is a two week expedition. We began waving our arms and saying “Hippo!”, they stopped and made an “I don’t care” gesture before revving off into the distance. The hippo had now moved under us due to them stopping their huge boats directly over him. A few dangerous moments ensued as the hippo looked for a safe place to swim without having to crush one of the mokoros and we tried to move away without much fuss. Their boats turned pristine, waving lily and water lettuce beds with fish to churned up mush for the next two hour. Their massive propellers had completely disturbed this fragile and beautiful ecosystem, which they could not possibly see or appreciate sitting on the boats. This world under the water had become our television for the ;last 2 weeks. If you were bored of looking for wetland birds, you could stare down into the crystal clear water at the flowing gardens and plentiful fish. We have been filming a lot of this with a GoPro video camera with waterproof housing. Some awesome scenes that take you out of this world. Attached to a spear and dangled off the edge of the mokoro, the GoPro zooms over what looks like massive green, red and yellow reefs of vegetation set above the white sandy bottom. Absolutely stunning in the sunlight. Snorkeling in this wonderland is an amazing experience. Remember crocodiles look up for their prey, so swimming down deep is safe… or is it? We recorded our 2000th wetland bird sighting as we came into our camp for the night. Just after striking camp we bumped into an old friend, Kutlwano (“Kit”) on his way to Xigera and met some fisherman, who eventually gave us 10-odd bream for us to smoke for lunch. We saw an African Skimmer late in the day on a nest site without eggs. Great sighting in amongst all the Squacco Herons. By lunchtime on Day 15 (Saturday 20th) we pole and paddle our way to Maun, to the Okavango RIver Lodge (see photo). After off-loading we all found each other at the bar. This was not planned, and was more like moths gathering near bright, buzzing beer fridge. Our first cold beers were as good as I had rehearsed in my mind the night before. Ahhhhhh:) Next was an urgent rush to draw payment for GB, Chaps and Tom, pay them, and get our stomachs closer to a burger at Audi Camp. In Maun Town we began bumping into old friends and ended up having a stand up dinner of beer and pizzas at Sports Bar before one by one members of the expedition team peeled off to have their first shower in 2 weeks and then into the crisp sheets of fresh, soft bed. The excited chatter all night was about what we are going to do next year, how the equipment can be upgraded, a reality show on the expedition next year, and the many elephant, hippo, buffalo, lion, leopard and wetland bird experiences we share on this epic journey. Yes, we all decided the best way to describe the 2010 expedition was simply to say: “Epic!”. It certainly was and we look forward to next year and another huge flood, interesting new wetland bird sightings, and 14 new islands to camp on. The next blog on the Okavango Delta will be about the reasons behind us risking our lives to undertake our first unassisted crossing of the Okavango Delta. We will discuss World Heritage Status and the people driving this process.